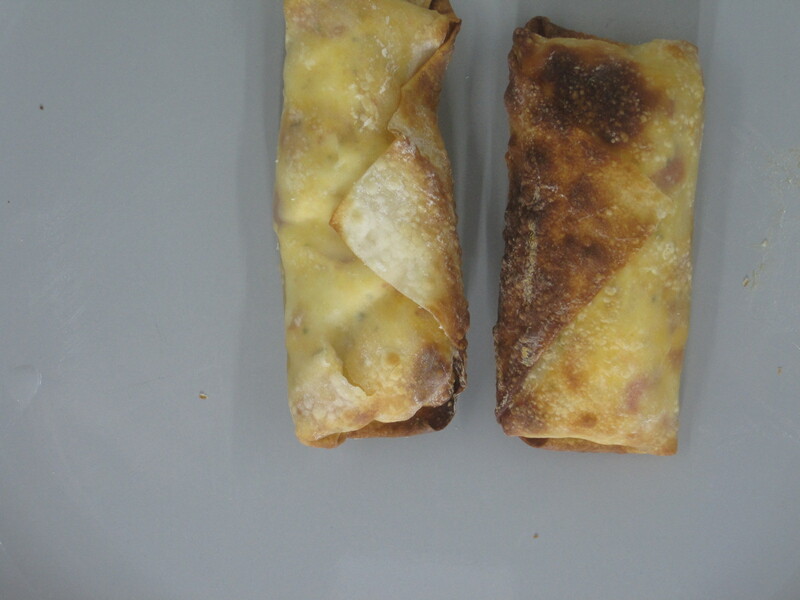 Italian Egg Rolls were something that I created one evening when we were trying to decide what to eat. I don’t really like to turn on the oven during the summer months, and I’m not a big fan of deep frying foods. It’s not for health reasons. It’s because it seems so time consuming, and I didn’t feel like standing over the stove while the egg rolls fried. 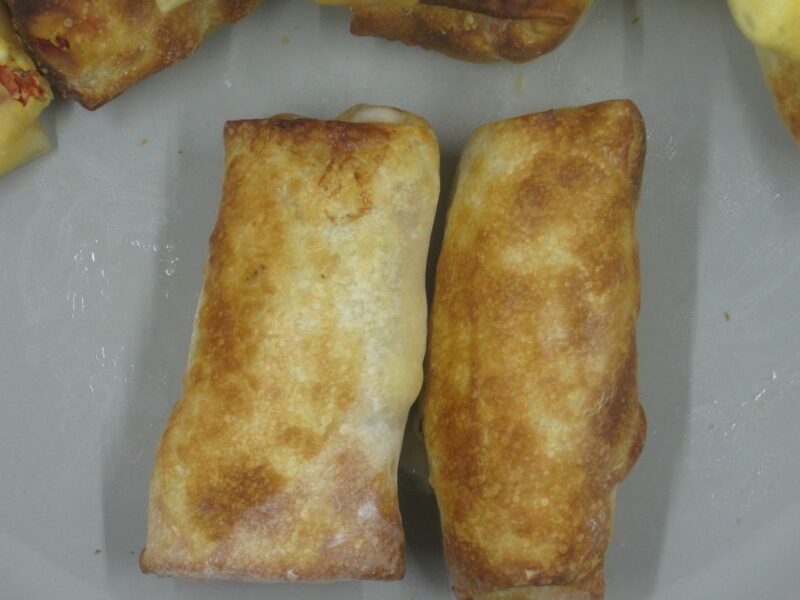 I really wanted to make egg rolls, so I decided to try making these Italian egg rolls with the air fryer. The result was delicious, though the recipe did require some experimentation to get the cooking time just right. The best part of these egg rolls is that they could be assembled beforehand and stored in the freezer until you’re ready to “fry” them. Of course, the cooking time would take longer, but the convenience would be worth the extra cooking time. 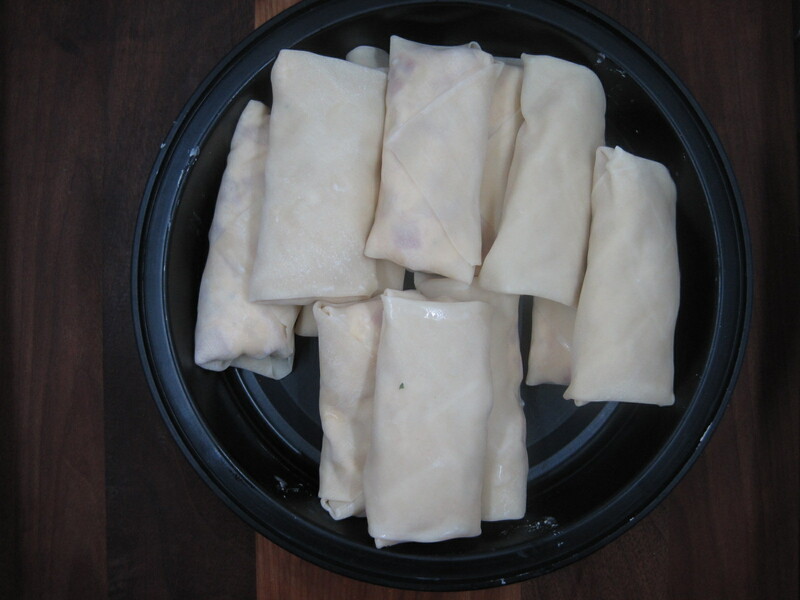 Making these egg rolls is a bit time consuming, but the process is simple. Once you’ve done this, you’ll wonder why you haven’t been making homemade egg rolls your entire life. All of the filling ingredients go into a bowl. Then they’re mixed together until they’re well combined. Rolling them up is a bit more complicated, but not really difficult. 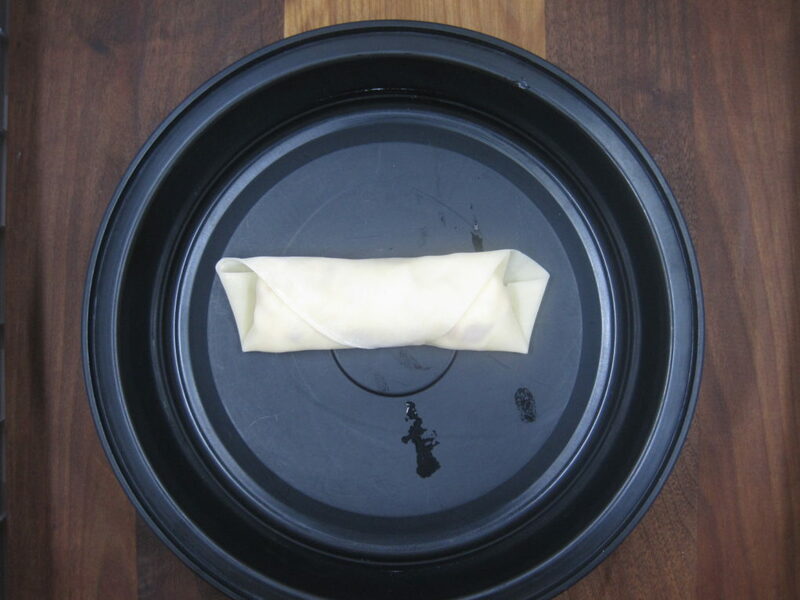 First, you place a row of filling in the center of the egg roll wrapper with the wrapper positioned so that it makes a diamond. Fold the bottom of the wrapper up and over the filling and slide it back so that it’s snug against the filling to help hold the shape. Fold in one side of the wrapper. Then, fold in the other side of the wrapper. Continue rolling up all of your Italian Egg Rolls until you used all of the filling. This recipe made 12 egg rolls. Once you have all of the Italian Egg Rolls assembled, it’s time to put them in the air fryer. Only place them in a single layer because, if you have them stacked on top of each other, they don’t cook evenly. Part of them will be soggy and some parts will be overcooked, or burned. This photo clearly illustrates the problem of uneven cooking that occurs when the Italian Egg Rolls are stacked in the air fryer. When cooked in a single layer, they cook more evenly, they’re crunchy all over, and they look nice. If you like, you can flip them over half way through the cooking time to make sure they come out evenly cooked. We really liked these Italian Egg Rolls. Their creamy filling was warm, gooey, and delicious. Baker’s Man, Sue Chef, and Food Critic all gave them two thumbs up. My co-workers who tried them, reheated in the microwave the next day, enjoyed them, too. Unfortunately, reheating them that way caused them to lose their crunchiness. Regardless, they were still quite good. Since they were prepared in the air fryer, they’re also lower in calories that if they’d been fried in oil. 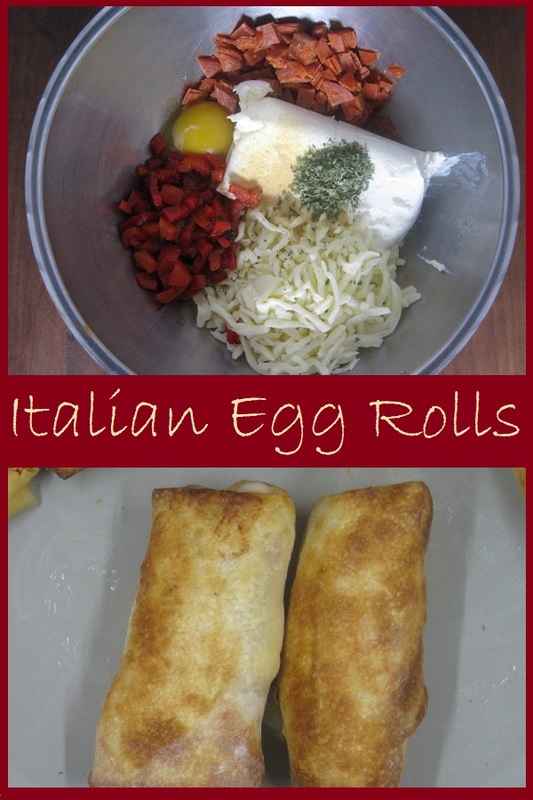 Give our recipe for Italian Egg Rolls a try and let us know what you think by leaving a comment below. 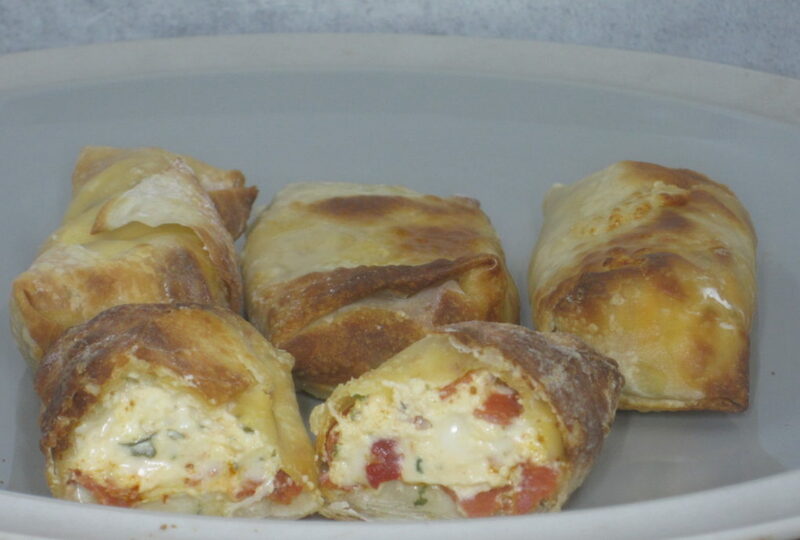 Creamy, cheesy, Italian flavors are combined in an egg roll wrapper. These are a great appetizer or they can even be an informal dinner. Serve them as is, or with a side of marinara sauce for dipping. The total cost of this recipe is $5.80 or about $0,49 per egg roll. Water for sealing the egg rolls. Chop roasted red peppers and sliced pepperoni and place in bowl. 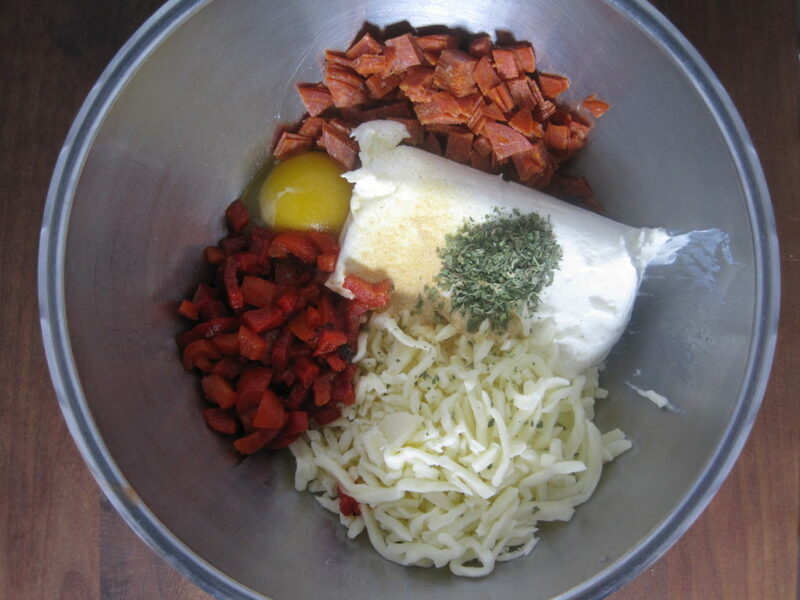 Add shredded Mozarella cheese, cream cheese, garlic powder, parsley, and egg to the bowl with the roasted red peppers and chopped pepperoni. Mix ingredients until well combined. 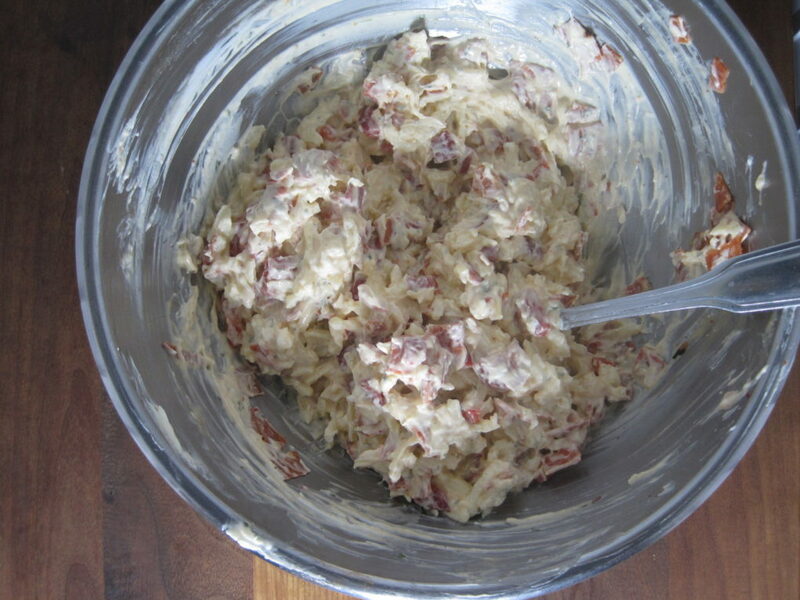 Divide filling into 12 equal portions. 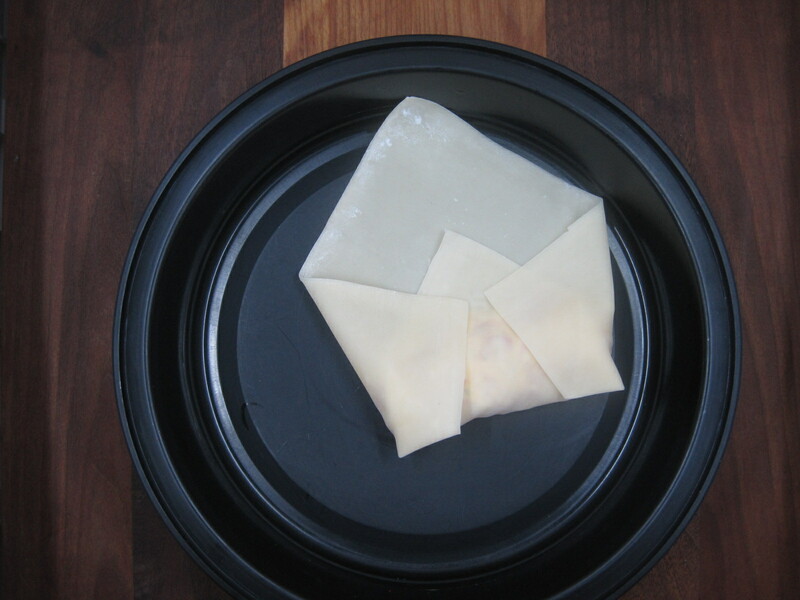 Place one egg roll wrapper on a plate or cutting board. 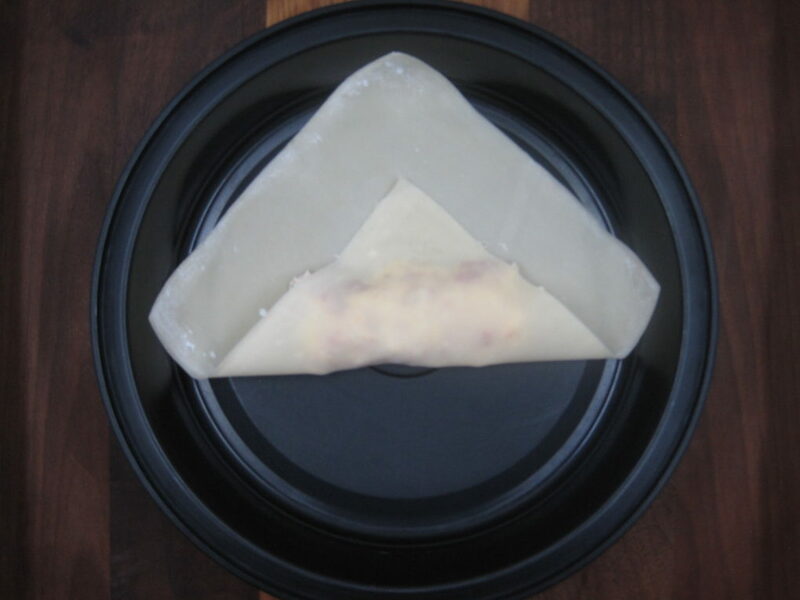 Place one portion of filling in the center of the wrapper, shaping it into a log that goes across the center of the wrapper oriented from corner to corner, but only filling the middle two thirds of the wrapper. 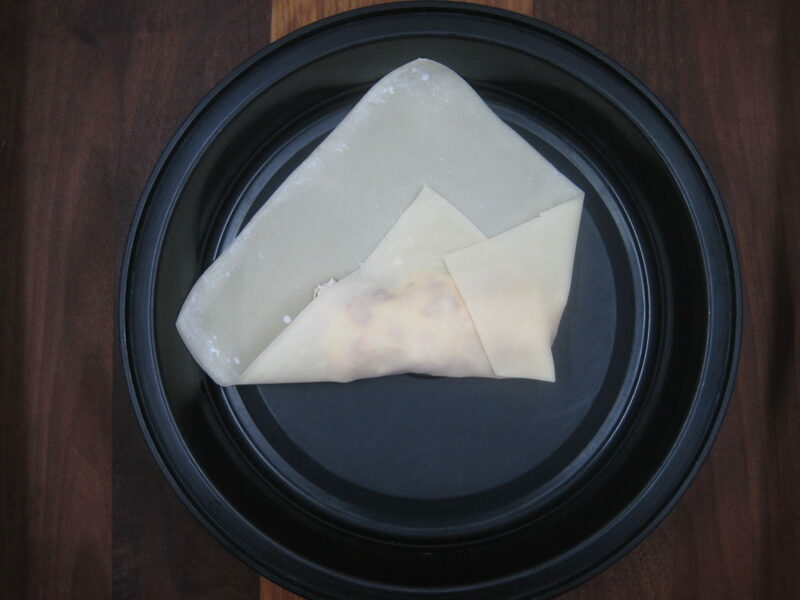 Fold the bottom corner of the wrapper over the filling, and use your fingers to snug the wrapper against the mound of filling. 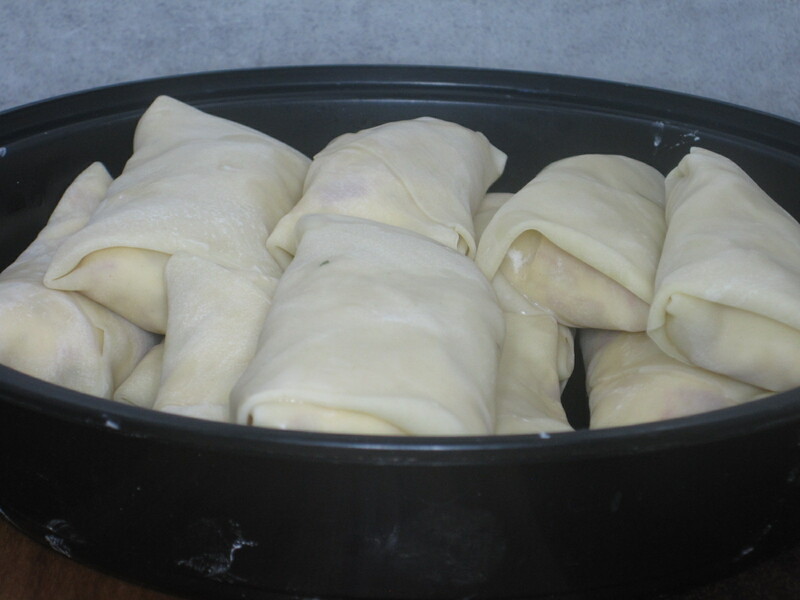 Fold one side toward the middle to cover the filling. Fold the other side toward the middle to cover the filling. Dip your finger into the water and brush the water along the edges of the remaining unfolded dough. Roll the egg roll up until it is sealed. 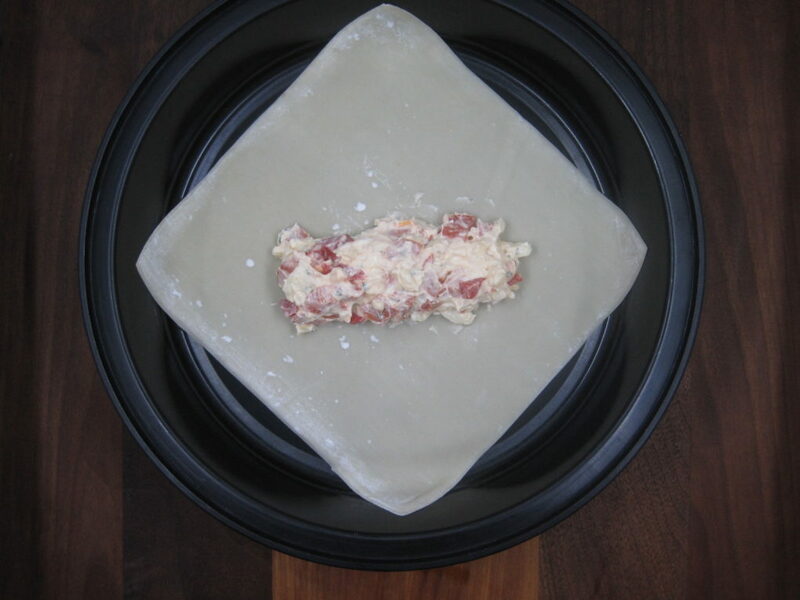 Place finished egg roll on a platter. Repeat the folding process (steps 6-12) 11 more times. Set the temperature on the air fryer to 400 degrees. Serve as is or with a side of marinara sauce for dipping. Nutrition information is for one Italian Egg Roll prepared according to the recipe above.